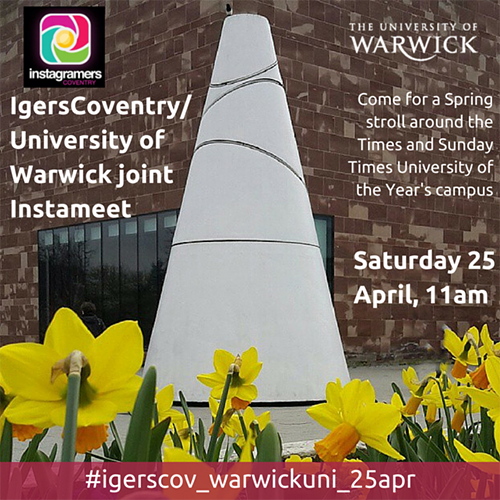 We’ve teamed up with the official Instagram group for Coventry and Warwickshire to organise a joint Instameet on campus this Saturday, 25 April 2015 – why not join us? For those who aren’t sure, an Instameet is a meet up for Instagram users. We’ll be going for a Spring stroll around campus, taking photos and then posting them to a shared hashtag afterwards. It’s a great way to meet people and gather some brilliant photos. The meet is open to all Instagram users and will offer the chance to connect with other Instagrammers from the local community. This is the second time we’ve joined forces with our local Instagram community, following a successful meet on campus back in October. The meeting point for the Instameet is the Koan at 11am. If you’d like to join us, please email Dave Musson at D dot Musson at warwick dot ac dot uk. Follow @universityofwarwick and @igerscoventry on instagram.